It is important that patients receive the most up to date technical investigations and treatments, such as MRI scans and the latest innovative drugs, but equally important is that they receive a good standard of personal care, in terms of such issues as staff attitude, nutrition and hygiene. We have implemented various initiatives within the Trust on the above themes and undertake regular audits and reviews to establish standards which support continuous improvements in patient care. Every month 10 nursing records and other documents are checked at random in all general wards and departments at the hospital and in every nursing team in the community (in effect, approximately 400 records are audited in total per month) to ensure that nurses are undertaking activities that patients require and documenting that activity. The initial themes looked at were: Patient observations (Temperature, Pulse, Respirations etc), Pain management, Manual handling and falls risk assessment, Tissue viability – prevention of pressure ulcers, Nutrition assessment and monitoring, Medications and Prevention of infection. Further themes have been added or amended: a) in September 2011, ‘ThinkGlucose’ programme to monitor diabetes, Documentation and Bowel Function Assessments were added and b) In July 2012, Fluid Balance was added and the infection control section amended. The completion rates of each ward and team are fed back to the Matrons and ward managers for action where necessary. Each ward/team and the whole hospital and community service is RAG (Red/Amber/Green) rated with initially a ‘Green’ given for a 90% or greater score, an ‘Amber/Yellow’ 89-70% scores and a ‘Red’ for scores 69% or less. Due to overall general improvements in scores, it has recently been agreed to make the criteria stricter in that, for example a ‘Green’ score will only be given for 93% and above. This change will be adopted into next year’s Quality Account results. The table below shows the end of calendar year position for each of the criteria assessed and changes from year to year. In 2012 we have improvements in 7 of the 11 criterion. Infection control figures (*) show a fall however the questions for this assessment have been totally changed in July 2012 and so a direct comparison with 2011 is not possible. The table below shows the end of calendar year position and changes from last year for Community Services for each of the criteria assessed. In 2012 we have improved in 3 of the 9 criterion (Manual Handling, Tissue Viability and Infection Control). 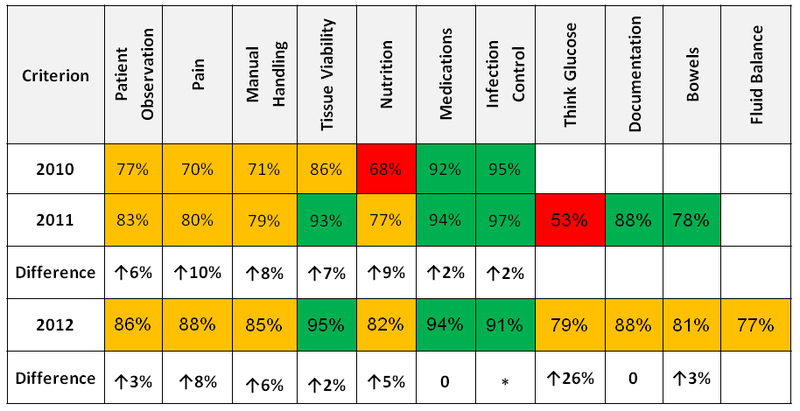 During October and November 2012 a more systematic approach to assessing skin care and making correct care and treatment decisions was introduced which will have helped increase the score on Tissue Viability. Due to the high levels of compliance the details of all of the indicators are being reviewed to set higher performance targets so ensuring the highest possible standards of care. Building on our existing improvements, ‘Harm Free’ care (meaning the absence of the above harms) can be measured using the NHS Safety Thermometer, so called as it provides a ‘temperature check’ on harm.